This 6000 sq. 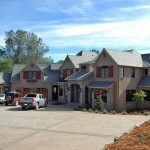 ft custom home in Cool, CA was a true test of our abilities and product knowledge. The challenge was not the seamless rain gutters themselves, but choosing a micro-filtration system that could handle the volume of water cascading from the steep slate roof. 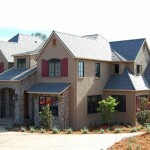 The contractor wanted leaf protection that would provide a maintenance- free rain gutter system. 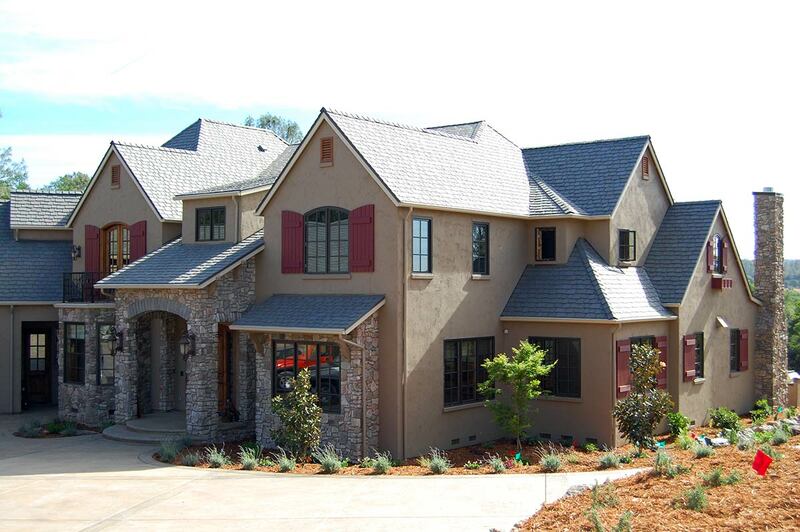 We recommended 5” Ogee gutters with 3” round downspouts, and a micro-filtration gutter protection system. Micro-filtration gutter guards filter the rain water with a micro-screen before it flows into the gutter, removing 100% of the debris. The challenge with this installation is that the volume and speed of the water created by the steep roof would overwhelm the system. The gutter protection system would have to be mounted to the fascia board, to slow down the water and protect the roof line. All About Gutters and Awnings solved this problem by dropping the leaf guards one 1/2 inch from the roof line, creating more surface area on the screen with a bigger gutter. The 3” round downspouts allowed us to have longer runs of gutter, and increase the volume of each spout. The Ogee gutter complements the style of the home and helps the gutter guards collect more water. The product is working very well, shedding material and filtering a 100% of the customers rain water. New construction in Placer and Nevada Counties requires metal rain gutters and leaf guards to ensure the safety of homes and protect them from fire damage. [All About Gutters and Awnings] promptly responded to my quote request, provided good advice about what to have done and what not to have done, and completed the work in a timely fashion.